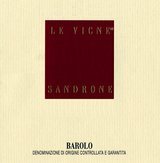 A noble wine that originates from the meeting of various Nebbiolo vineyards, each of which makes its own personal contribution. This union generates an exceptionally complex wine which is round and harmonious on the palate, with fruity and spicy notes. Shows gorgeous strawberry tart aromas, with fresh flowers and subtle vanilla bean. Full-bodied, with seamless tannins and a solid core of beautiful fruit. Lots of new wood. Needs more time to come together.-'99 Piedmont blind retrospective (2009). Best after 2011.